If you knew the heights and depths of my love for the Lord Jesus Christ, my love for people and relentless passion to tell people about Him and to help them find and forever faithfully follow Him, you would understand why this is not your typical bookstore. 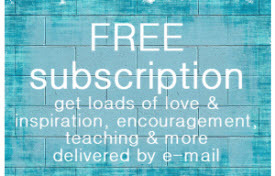 All six of the books I have written, along with my Gospel tracts and devotionals and devotional magazines and online Good News Daily, are FREE as the Lord leads and provides. The books are FREE via PDF file. Print copies can be ordered for a donation to help cover shipping. As of March 2019, due to changes with the printing company, there may be a wait. Please call me at 843-338-2219 or e-mail me at lara@GoodNews.love to learn more. Please learn about the books below. 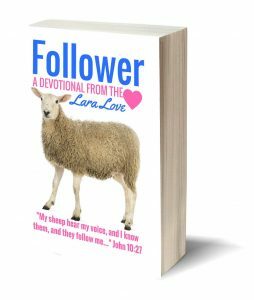 A devotional straight from the heart of Lara Love jam packed with love, encouragement, inspiration, and sound Biblical Truth to help the Lord’s sheep live in full devotion to Him forevermore. Utterly convicting, power-packed with Scriptures, Follower serves as an impetus and incentive, a virtual cheerleader and a reminder to help readers to not just set apart time for the Lord each day, but to set apart their lives for Him in making and maintaining a life-long commitment to following the Great Shepherd each and every breath. Lara loves to help sheep follow their Shepherd. This devotional will help you do just that! We are living in troubled times, aren’t we? Who couldn’t use a little faith, hope, love, and inspiration along the way? Join Lara Love of Walk by Faith Ministry as she shares with you selections from her almost Daily Inspiration online. Be prepared to laugh – and to cry, to be encouraged and to grow, to be challenged and to be inspired. Don’t be surprised if when you are finished reading what lies in these pages, you have a whole new outlook on your journey – one of hope and strength, and one of renewal and thanksgiving. Sometimes really big messages come in super small packages. Once upon a time there was a homeless dream who desperately needed a home. If you have ever wondered what your purpose is in life, or struggled to find out if there is more to life than the way you have been living it, or been discouraged about how meaningless your life seems to be at times, or simply needed encouragement to press forward with your life’s purpose, this little fiction story may be just for you. 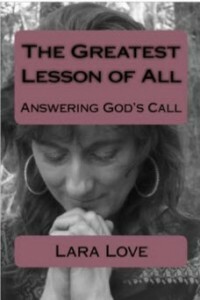 And tucked into the pages of this little book is the true life story of evangelist and author Lara Love along with the greatest message in the universe she is quite certain you will ever hear! So you’ve wanted to know God’s purpose for your life for as long as you can remember. Or maybe you’re already living it. So how do you answer God’s call? Do you take the call? Screen it? Avoid it? Tell Him you’ll take the call later? Run the other way? No matter His purpose for you, no matter the call, no matter the response, don’t miss the greatest lesson of all. Join Lara Love of Walk by Faith Ministry on an altogether serious, albeit delightfully hilarious, adventure as she dives deep into the Bible’s Book of Jonah to discover the trials and triumphs of answering God’s call. As Lara Love challenges and encourages you to apply the revelation gleaned from Jonah’s journey to your own life, get ready to learn THE GREATEST LESSON OF ALL. 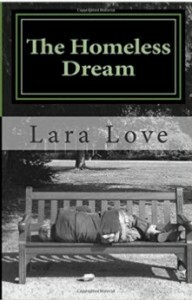 Learn more about Lara Love and Walk by Faith Ministry at www.walkbyfaithministry.com. 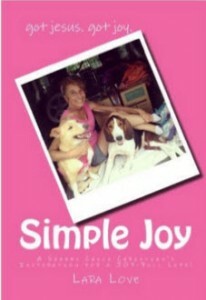 SIMPLE JOY: A SHABBY CHICK CHRISTIAN’S INSPIRATION FOR A JOY-FULL LIFE! An upbeat, off-the-beaten-track, wildly different, everything-but-run-of-the-mill, delightfully hilarious, and totally encouraging INSPIRATIONAL little book by the free-roaming, free-range, faith-without-frills, Shabby Chick Christian director of Walk by Faith Ministry, Lara Love. Be inspired. Be encouraged. Get ready for some serious JOY! Your life will never be the same. 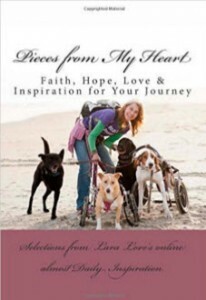 Lots more on Lara Love and Walk by Faith Ministry at www.walkbyfaithministry.com. I cordially invite you to Slow Dance with Jesus. I took a long, hard, broken road to get to the dance. But this is not my story. It is inspiration for yours. 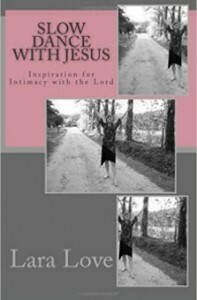 It is an invitation, and encouragement, to enter into a deeply personal, passionate, intimate relationship with the Lord that is uniquely yours and His. I spent years seeking love, acceptance, comfort, validation, significance, purpose, hope, refuge, safety, and protection in a slow dance with a man. I came away empty. Now I dance in the arms of the Lord. He takes my breath away.